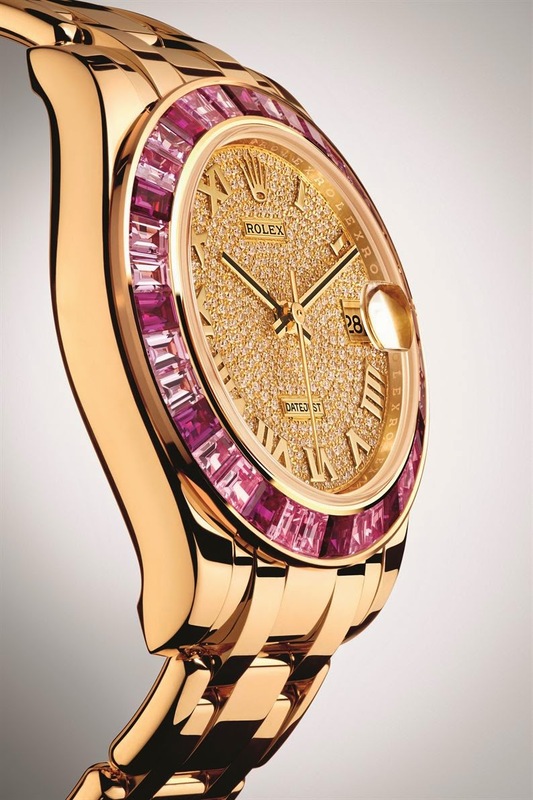 Rolex is introducing new gem-set versions of the Oyster Perpetual Datejust Pearlmaster 34 in 18 ct yellow, white and Everose gold. 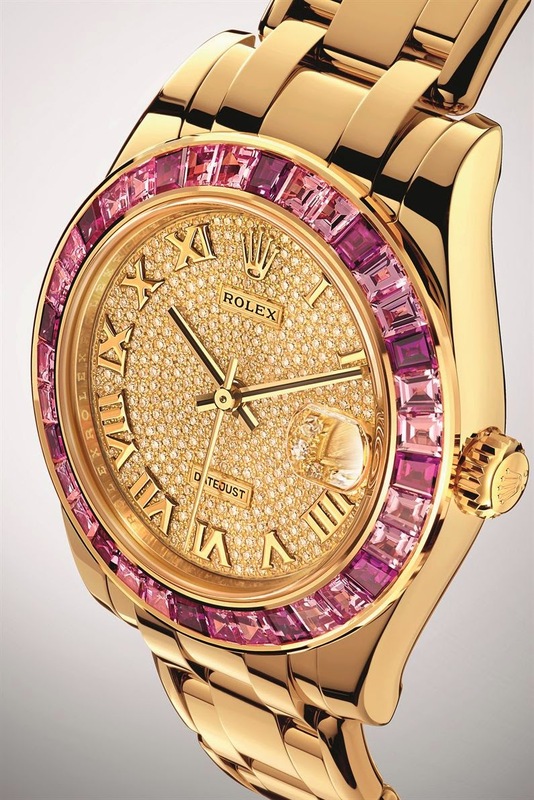 Rolex’s watchmaking art is stunningly combined with the captivating charms of gold and the purest, most scintillating of diamonds. 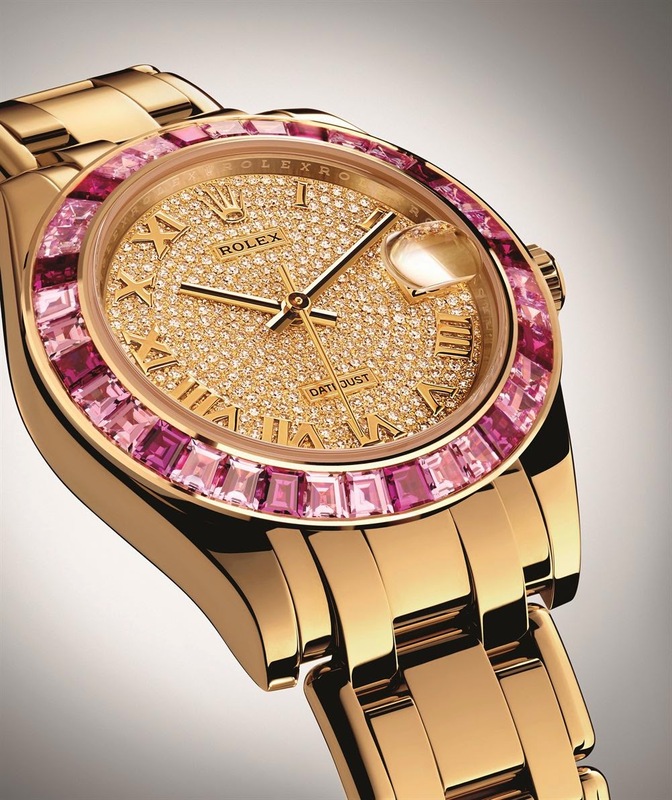 Rolex’s mastery in gem-setting is founded on the same standards of excellence that have earned the brand its unrivalled place at the pinnacle of watchmaking. 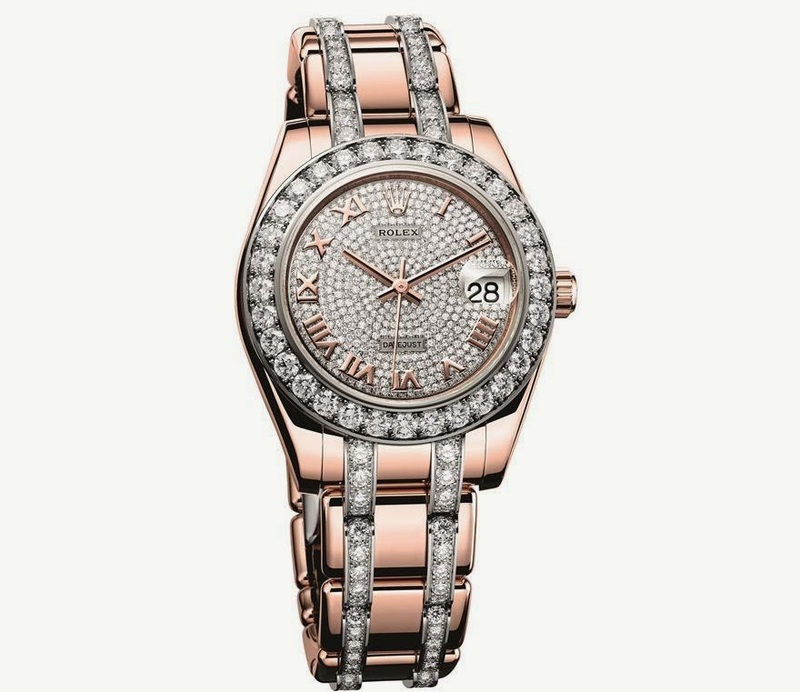 The dials of these exquisite 34 mm watchmaking masterpieces are entirely paved with diamonds. The nobility of the time display is enhanced by the bezel adorned with baguette-cut pink sapphires on the 18 ct yellow gold version, or with baguettecut blue sapphires on the 18 ct white gold version. 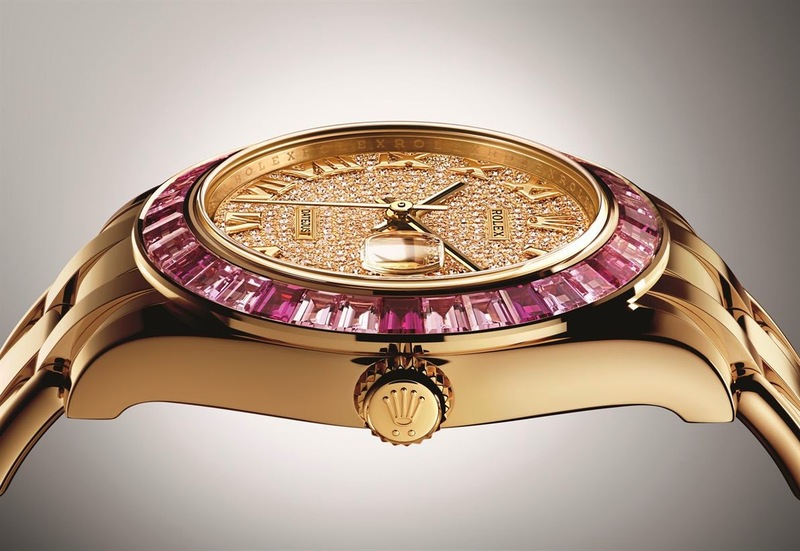 The version in 18 ct Everose gold – an exclusive pink gold alloy created by Rolex in its own foundry – is distinguished by a splendid bezel with brilliant-cut diamonds set in 18 ct white gold to accentuate their splendour. These three versions may also be fitted with diamond-set bracelets. 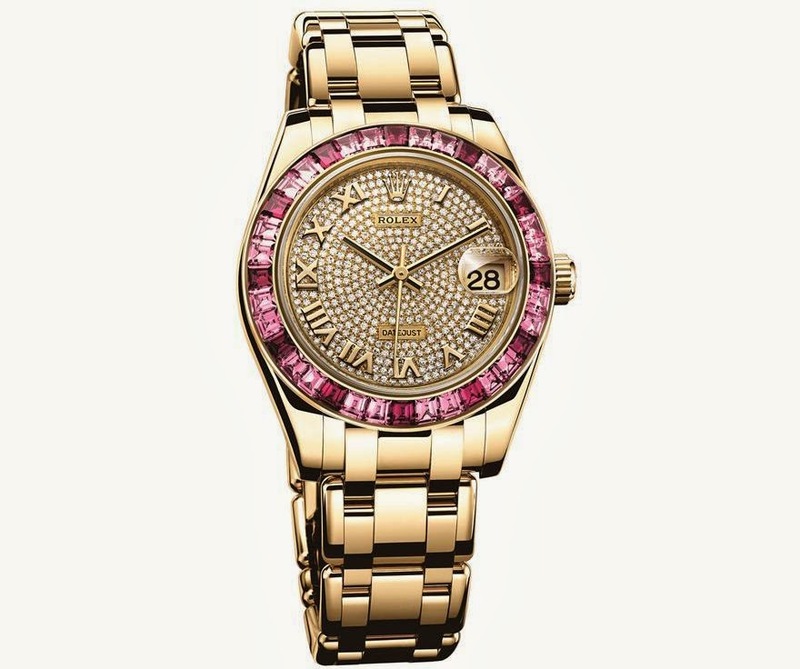 Only gems of the highest quality are deemed worthy to be set on a Rolex watch. The purest diamonds and sapphires are selected according to the most rigorous criteria and set in keeping with the finest traditions to ensure the most intense radiance. Rolex has its own gemmology laboratory in which experienced specialists backed by state-of-the-art equipment control the quality of precious stones according to the most exacting standards; barely one per cent of worldwide diamond production meets the Rolex quality criteria. The stones are then entrusted to the in-house master gem-setters, experts in the art of exalting their natural lustre. Rolex has its own foundry where it creates its own gold alloys from the purest raw materials: 18 ct yellow, white or Everose gold. From casting the gold to shaping and polishing it, the entire process is conducted with extreme care in the brand’s workshops in order to guarantee the Rolex standards of quality. Thanks to this comprehensive in-house mastery and such stringent benchmarks at all stages of production, Rolex gem-set watches shine with truly incomparable magnificence. The jewelled refinement of the Oyster Perpetual Datejust Pearlmaster 34 only complements its technical excellence as a Rolex watch. Its Oyster case, guaranteed waterproof to a depth of 100 metres (330 feet), is a paragon of robustness, proportion and elegance. The characteristically shaped middle case is crafted from a solid block of 18 ct gold. The fluted case back is hermetically screwed down with a special tool exclusive to Rolex watchmakers. The winding crown, fitted with the patented Twinlock double waterproofness system, screws down securely against the case. The crystal, with a Cyclops lens at 3 o’clock for easy reading of the date, is made of virtually scratchproof sapphire. The waterproof Oyster case provides optimal protection for the Datejust Pearlmaster 34’s high- precision movement. The new Oyster Perpetual Datejust Pearlmaster 34 is the first model equipped with calibre 2236 and the new Syloxi hairspring in silicon developed by Rolex, which endows it with a level of chronometric performance rarely seen on a woman’s watch. This self-winding mechanical movement with date display is entirely manufactured by Rolex and inaugurates a new generation of movements for Rolex ladies’ models. Its design and quality manufacture ensure peerless precision and reliability. Like all Rolex Perpetual movements, the 2236 is a certified Swiss chronometer, a designation reserved for high-precision watches that have successfully passed the Swiss Official Chronometer Testing Institute (COSC) tests. With delightfully rounded solid links in 18 ct gold, the Pearlmaster bracelet contributes to the watch’s individual character and offers the wearer maximum comfort. It is equipped with a concealed Crownclasp that is both elegant and functional. On certain versions, the intermediate bracelet links are sublimely set with diamonds of the highest quality. A subtle echo of the bezel, this superb gem setting provides the finishing touch to an authentic and very feminine archetype of watchmaking.